History Department on Who Do You Think You Are! Former Head of History Dr Frank Tallett recently played a starring role in the BBC TV series Who Do You Think You Are. 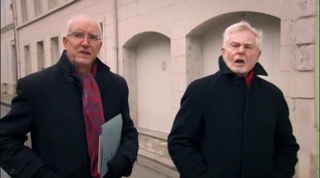 The programme featured Sir Derek Jacobi tracing his family history, and the BBC consulted Frank as an internationally-renowned scholar of French history. Here Frank writes about his experience of taking part on the programme. I was contacted by ‘Wall-to-Wall’, the company that produces the Who Do You Think You Are? programme for the BBC, early this year. They asked for some help in finding out about an ancestor of Sir Derek Jacobi. The ancestor, Joseph de la Plaigne, was a Huguenot who had fled to England in 1701. We managed to unearth quite a lot of material about Joseph in the French archives. He turned out to have been an extremely wealthy financier who also held a high position in the royal bureaucracy in Guyenne. If Joseph had been a humble artisan, then I doubt that there would have been many traces of him in the archives. Professor Joel Felix was really helpful in transcribing some of the documents: written in 17th-century hand, they were not always easy to read. It was disappointing that we never managed to locate a picture of Joseph. In March I travelled to France and we spent two days filming in Paris and at Loches, the prison where Joseph had been held. As you know, the Huguenots were persecuted after Louis XIV revoked the Edict of Nantes (which had allowed them religious and civil freedoms) in 1685. Joseph lived a double life, pretending to be Catholic, until he was denounced in 1700 and sent to Loches. He managed to escape in 1701, almost certainly through the use of bribery, and got away to England. The escape was fraught with danger: the punishment for any Huguenot caught attempting to flee the country was to be sent to the galleys where he would have been chained to an oar 24 hours a day. Joseph was in his early sixties at this point, and he would not have survived the brutal life on the galleys for very long.As it was, he got away and married shortly after getting to England. He had a son, but tragically died just before the child was born. Doing the filming was great fun. All the team were very professional and friendly and quickly put me at my ease. Derek was absolutely charming and fascinated by his ancestor’s history. He had no idea what was going to be revealed before the scene were filmed, by the way, so his reactions captured on camera were completely spontaneous. Perhaps the worst part was filming at Loches, where it was bitterly cold and we all struggled to keep warm. This entry was posted in Comment, In the Media and tagged BBCOne, French History, Sir Derek Jacobi, Who Do You Think You Are. Bookmark the permalink. 1 Response to History Department on Who Do You Think You Are!